The management of DR Congo’s Virunga Park announced on Tuesday that it has temporarily halted tourist activities after the murder of a guard and the kidnapping of two British holidaymakers. “The Virunga National Park has decided to suspend tourist visits until Monday, June 4 because of the security incident that occurred on Friday, May 11, 2018,” a statement said. On Friday a Congolese park guard was killed in an attack before two British tourists — Robert Jesty and Bethan Davies — and their Congolese driver were kidnapped. The three were freed after two days. The UK pair were unharmed, while the driver was injured. One of the most important conservation sites in the world, Virunga Park covers 7,800 square kilometres (3,000 miles) along a swathe of eastern DR Congo abutting the border with Uganda and Rwanda. It also covers most of Lake Edward and the Ishasha river valley. Established in 1925, Virunga is home to about a quarter of the world’s population of critically endangered mountain gorillas, as well as to eastern lowland gorillas, chimpanzees, okapis, lions, elephants and hippos. 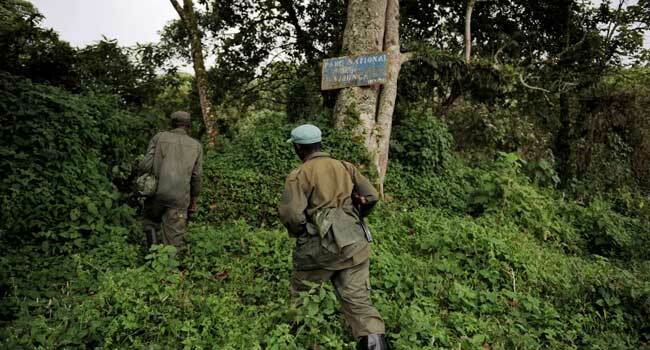 But it is located in DR Congo’s North Kivu province, where armed groups are fighting for control of territorial and natural resources, and poaching is a major threat. Eight eco-guards at Virunga Park have died in the line of duty since the beginning of the year.